If you follow @southerninlaw on Instagram, read the meal plan in our weekly newsletter - or even follow us on Twitter or Facebook - you'd know I have a bit of a problem. That problem is an addiction...... to Freelicious' Gluten Free Couscous. Before going gluten free, I'd never tried couscous - but when Freelicious came out with their Gluten Free Corn Couscous - I knew I had to try it. Since first trying it, I haven't been able to stop eating it. It's so good! To the point where I have to stop myself from eating it every. single. night. and I think it's okay to eat it four nights in a row, because duh I changed the pumpkin to roasted sweet potato so it's different. The other day I asked Jesse what I should have for dinner and he said "not couscous" because I'd had it so often - and I'm buying 6000 tonnes of feta cheese just because it tastes so good with it. Mum said the other week "Kristy, why is there 4 blocks of feta cheese in the fridge?" and that was because a) it was on sale b) I need to feed my addiction, literally. I know what you're thinking - you saw raisins up there and you're thinking.. "Oh wow.. now she's really lost it".... Bear with me, you won't regret it. 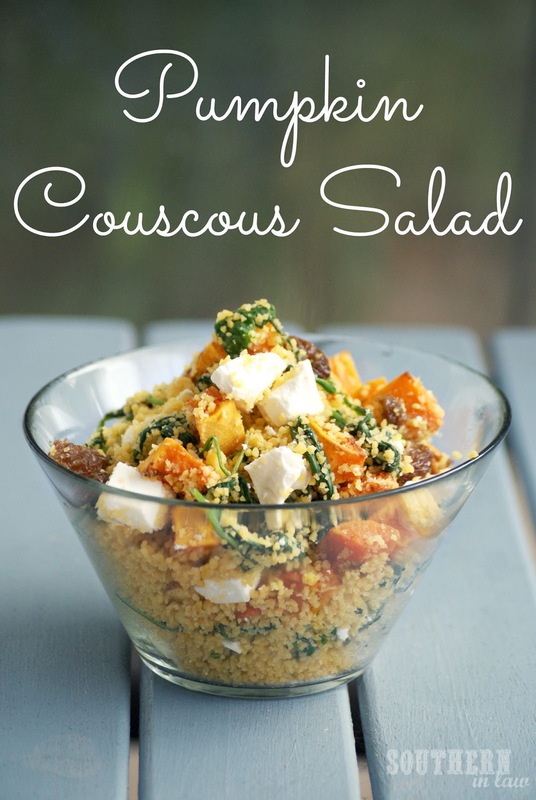 The chewy, sweet raisins give this couscous salad a whole new level of deliciousness. We had a dinner party on Saturday and my Dad saw me putting raisins in the couscous and said "Oh yuck Kristy... I don't think anyone really wants that except you" (because I am known for odd combinations) only to eat the couscous that night and say "you're pretty smart aren't you - you think outside the box and it works, I love the raisins"
But then again - I won't say anything if you leave them out other than WHAT ON EARTH ARE YOU DOING THEY TOTALLY MAKE THE DISH! But enough yapping and onto the recipe, huh? In a saucepan, cook your couscous with the water and garlic salt according to the package directions, fluffing with a fork as you go. Once your couscous has cooked, pour it into a mixing bowl to cool off. In the same pan, add your spinach and crushed garlic and cook over a medium heat until wilted, stirring constantly. 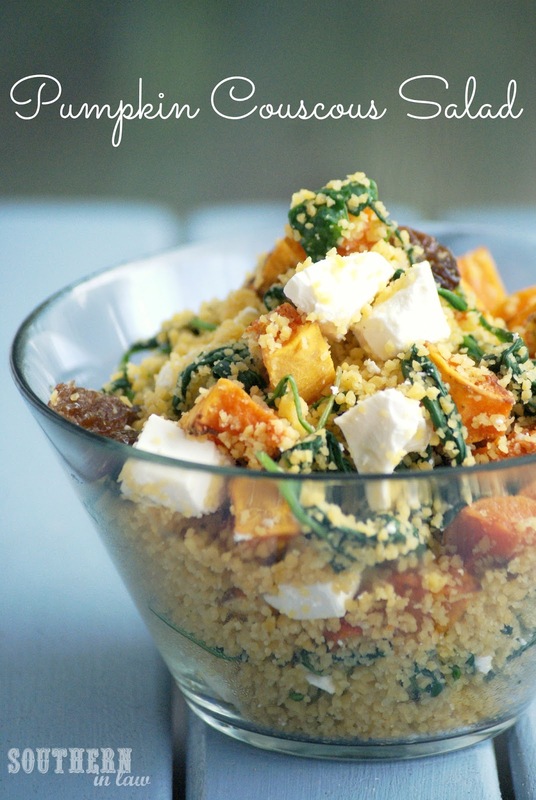 Once the spinach has wilted, remove from the heat and mix your spinach and roasted pumpkin through your couscous. Place your mixing bowl into the fridge to chill. Once the couscous has chilled, mix through your crumbled feta and raisins. Serve cold or warm slightly. **I roast my pumpkin in garlic and herbs at about 200°C/400°F until caramelised and browned. You can also use roasted sweet potato if you prefer! So tell me, raisins in a salad - yay or nay? and what's your crowd pleasing dinner party dish? Kristy purchased the Freelicious Corn Couscous herself and has not had any communication with the company about this recipe or post. She's just an addict. Yum I love raisins in salads! Especially in salads with a middle eastern feel like this has. 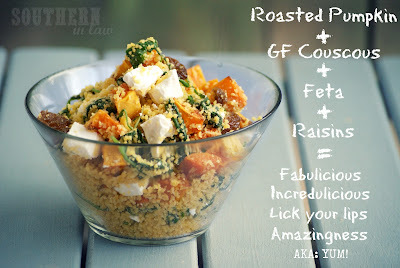 I will need to keep an eye out for GF Cous cous, it sounds delish. In fact this whole salad sounds amazing! This looks delicious Kristy!! I NEED some of this ASAP!!! Plus it is so simple!!! Thanks for sharing! Have a great weekend! Thank you, lovely! I hope you have a fabulous weekend also!